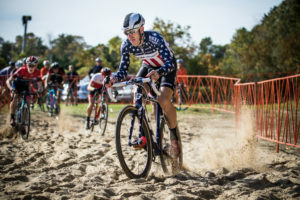 The Really Rad Festival of Cyclocross joins the USA Cycling ProCX calendar for 2018 featuring two days of UCI Category 2 racing. On November 3-4, the Cape Cod Fairgrounds in Falmouth, Mass. will host the third annual event presented by International Cycling and Corner Cycle Cape Cod. For 2018, Really Rad will again partner with the National Multiple Sclerosis Society as the charitable beneficiary of the event. Their programs provide invaluable support to those diagnosed with MS. The NMSS will be set up on site to provide information and registration opportunities for their BikeMS events. A portion for the proceeds for the RRFCX will go directly to the BikeMS group Team Spinal Tap which is run by Rebecca Hamel (née Sykes). With two distinct race courses, racers will grind through fast, technical and physically demanding routes throughout the fairgrounds. Special attention to the course design ensures an excellent flow for riders of all abilities whether they are racing for themselves or riders who are locked in a head to head battle for the top prize. Registration will open today, Wednesday, August 22 at 12pm ET on BikeReg.